Statement of accuracy in ± (% of reading + display error in counts (= number of smallest points)). The accuracy is valid at a temperature of +23°C ± 5°C, and at a relative humidity of less than 75 %, non-condensing. The meter reads from and writes to several files on the flashcard. So far there are only 3 types of files for the Energy Logger 3500. There is a 102-Bytes info-file, a number of files with the meassured data (max 10564 Bytes per file) and it is possible to configure the device with a 20-Bytes file called SETUPEL3.BIN. 10 day history of consumed power. 10 day history of record time. 10 day history of ON time. Time & Date of initial setting. red (0x05-0x07) and (0x0E-0x10): total power consumption, big endian, in watt-hour (devide by 1000 for kWh). The program Conrad supplied only shows the double amount (0,188 kWh instead of 0,094 kWh). green (0x5D): A date. It looks like it is the start of the meassurement. Dec: 18 39 1 29 08 In the right notation: 29-01-2008 18:39, Is just before the first measured sample. N.B. Date-notation is different from the datafile. In february 2009, Conrad silently uploaded the documentation about the information stored in the files. Filesize is max 10564 Bytes. Maximum is 2110 samples per file (max numbers of samples seen in 1 file is 2105), which is about 35 hours of data. First 3 Bytes are: hex-values E0 C5 EA. File ends with at least FF FF FF FF and if there is a following file, the rest of the file is filled with FF's until the filesize is 10564 Bytes. The heart of the Energy Logger 3500 is the ps1000 made by Archmeter. 33V - Perhaps 3,3V ? 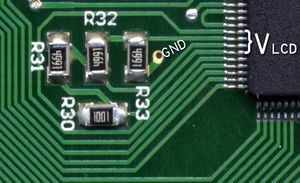 Resistor R30 controls the contrast of the display. The maximum contrast can be set when shortening R30 (making it 0 Ohm). It is possible to exchange R30 with a 10k-potmeter, but make sure you take isolation into account. So make sure you cannot touch the electrical parts of the print when the device is plugged into the wallsocket. It is quite possible there is no adequate galvanic isolation between the high-voltage lines and the rest of the print. The meter has some strange quircks which become apparent when using it for a longer period. Sometimes the data is corrupted on the SD-card. This can be caused by interferrence from e.g. a switching powersupply of a laptop or PC near the meter when dumping the data. The writespeed to the SD-card is about 1000 Bytes/sec. With about 5 bytes per logged minute, we're talking about over 7 seconds of write-time for each logged day of 24 hours. The data is not cleared from the device when dumped to the SD-card. 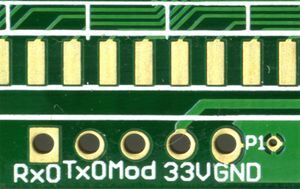 The internal clock of the meter stops when writing data to the SD-card. This can cause the clock to be off a few minutes each month, or even more when the data is not cleared after dumping. (the entire logged data is dumped to the card each time, even when it was dumped before) The clock-skew is about 7 seconds for each 24 hours of logged data. This can be over 3 minute 40 for a month worth of data for each time the data is dumped to the SD-card. It is possible to configure the meter using a 20-byte file called SETUPEL3.BIN. When you insert a SD-card into the meter with this file written on it, it will be used to configure the device. Like setting the date and time, the costs per kWh, currency and logger-ID. When uploading this file all previous logged data will be erased. Also the file will be deleted from the SD-card. This is quite impractical, since you have to dump the data to the SD-card, insert it into the computer to put a generated SETUPEL3.BIN file on it and place the SD-card into the meter again. Until now, there is no known firmware-update which can be done by the user and the meter has to be exchanged by Conrad. Conrad placed the entire datasheet, describing the fileformat online. The Energy Logger 3500 is sold by Conrad. Topic about this meter on the German forum "MeiserKuehler"
This page was last modified on 11 September 2011, at 11:43.